However, the special way in which it is impossible for me to pretend to offer a coldly objective review of Bob Dylan’s Shadows In The Night is this: I happen to know that he recorded this album for me. That has to affect things on some level. You see, while I like to think that I have eclectic taste in music, a quick glance at the CDs on my shelves or the gigabytes on my external hard drive would reveal that the music I’ve collected from two particular artists far exceeds the music I’ve collected from any other. Although I’m not into making lists of favorites—top ten favorite female singers, top ten favorite country songs, blah blah blah—there’s no necessity to sit back and wonder who my two all-time favorite musical artists are. They are Frank Sinatra and Bob Dylan. So it’s personal; so let me get a few more personal things out of the way before getting into the new album. (Skip down at will.) I became a fan of Bob Dylan as a teenager. It seems an apt time to get blown away by him; his mid-1960s material is, among other things, a perfect soundtrack for the turmoil of adolescence, whatever the era. I became an aficionado of Frank Sinatra a whole lifetime later—in my late twenties—and his music was more or less my entry point to the much larger world of what for the sake of shorthand we might call “The Great American Songbook,” and the many great singers who dedicated themselves to interpreting it and reinterpreting it, not to mention the great jazz players (though in the end the vocal renditions are the ones I return to most). For a couple of years back then, in fact, I stopped listening to any “modern” pop and rock-oriented music, including Bob Dylan. I was immersed in a gorgeous sea of beauty and perfection that utterly overwhelmed me—to think that I had dismissed this music before as boring and old hat!—and all that rock/pop/folk stuff seemed for a while just crass by comparison. It took a few years to phase back in the kind of music I’d enjoyed before, and to realize that the best of it was still worthy, just different. And this acknowledgement of its difference is important. 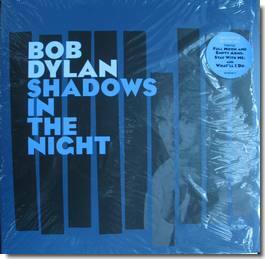 It comes into play on this album, Shadows In The Night, by Bob Dylan. It’s why it is not a given that I would love the sound of Bob Dylan singing these songs (although it is a given that I would be charitable towards his attempt). In the past, I’ve scorned some contemporary-type pop singers for trying to sing Gershwin and the like, feeling that they lacked the vocal ability, taste and dedication necessary to do those songs justice. And I believe I’d react the same way now to those same performances. I’m happy to consider myself a pop music fan, over and above other kinds of music with which my ears flirt. And popular music is actually a very broad area, in that when you start trying to plant fences, they quickly get knocked down. Yet, there is undeniably a different way of listening to popular music represented by the likes of, say, Sinatra, Billie Holiday, Mel Tormé, Sarah Vaughan, singing the songs of Kern, Gershwin, Porter et al, versus listening to Hank Williams, the Beatles, Bob Dylan, Elton John, Taylor Swift, et al. You have to appreciate the different disciplines involved in what they’re doing, or you’re just not going to appreciate what they’re achieving within those disciplines, even if it is all pop music in the end. Bob Dylan is not big on fences. He plowed through the dividing lines between folk music, poetry and popular music and even while so doing created some of the most incendiary rock & roll music imaginable. That was what he did back in the 1960s, just one decade of his now six decade career. On Shadows In The Night, Dylan has taken his big Cadillac Escalade and driven it right through the fence dividing George Gershwin and Hank Williams, and the one between Ella Fitzgerald and Tammy Wynette. But he’d be the first to acknowledge that he’s not a total pioneer in that respect. He has said that it was when he heard Willie Nelson’s Stardust album that he first thought of doing an album dedicated to standards. He told the honcho at Columbia Records, Walter Yetnikoff, about it, who told him in return: “You can go ahead and make that record, but we won’t pay for it, and we won’t release it. But go ahead and make it if you want to.” That was in the 1970s, and, in a bit of graciousness, Dylan grants that Yetnikoff was likely right, because he concedes that he wasn’t really ready to do it then. 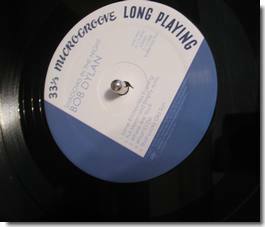 Dylan has of-course recorded some standards and the like before now, but there surely has always seemed to be a certain element of humor to those records. There is nothing funny about Shadows In The Night. This listener first heard it digitally, but I was determined to wait until I had heard it on vinyl and lived with it for a while before writing a review. I was struck, however, just on hearing it via the mp3 version, at how great it sounded, in terms of audio quality. This boosts the theory that it is the quality of the recording and mastering that matters in the end far more than the format in which someone ends up listening to it. Attention seems to have been paid by everyone to do this one right. Dylan’s voice, whatever its flaws, has never been captured so fully and warmly; the band’s bed of pedal steel, guitars, bass, and brushes underneath his voice has been captured with a depth and nuance that is unknown to most contemporary pop and rock recordings (including Dylan’s). And indeed let’s have a “Here’s to the Band” moment, because in the meat of this review (should it ever arrive) I will tend to focus closely on Dylan’s vocals. But what his five piece band (three tracks also feature some gentle horns) pulls off throughout this record is something for the ages, even if Dylan were to be said to have completely flubbed his part. Donny Herron’s pedal steel is of-course the central sound, and what a sound it is: undulating, surging, fading, sometimes all but singing, and evoking a ghostly and emotive string section virtually by itself. Tony Garnier’s bass, plucked or sawed, is just perfect and lovely and never showy. And on the subject of restraint, Charlie Sexton and Stu Kimball add gentle guitar strums and licks that give exquisite depth to the music. And George Receli on brushes—try to find him—deserves some special bejeweled trophy for barely-being-there-iness. This album is not a country music version of these songs, but the band—in particular with the pedal steel—draw from that palette of sound, and fit it around these tunes without conveying any strain, and that is quite an achievement. And as the quality of the recording itself is such a star, the engineer Al Schmitt at Capitol’s Studio B deserves credit for what he achieved on these sessions. He is an accomplished producer in his own right, though Dylan himself gets full production credit (as “Jack Frost”) for this record. But Schmitt was able to give Bob just what he wanted in the studio and it surely ended up working even better than they could have hoped. Dylan’s voice has never been captured better (not that that will make anyone like it who didn’t already like it). And speaking of country palettes—and as Mrs. C. pointed out—while Dylan is certainly not trying to imitate Sinatra’s voice anywhere on this record, you can, if you listen for it, hear a shade or two of George Jones. Like everyone, I’d already heard “Full Moon and Empty Arms” and “Stay With Me” as the “streaming” promotional pre-releases. These tracks didn’t prepare me for the rest of the album, however, because—although Sinatra gave both of these songs their popular debut—they were not prominent in my consciousness as Sinatra performances. The first was a 1945 Columbia side that had never greatly struck me, and the second an oddity on Reprise from the mid-1960s that had struck me even less. Hearing Bob Dylan sing these songs was as close to the same as hearing them for the first time; I had to go back and listen to how Sinatra sang them. That would not be true for the rest of the songs on the album. So, finally sitting on my floor in between the speakers and listening to Dylan sing “I’m A Fool To Want You” (a Sinatra classic through-and-through, one he actually co-wrote and which he recorded, definitively, twice) for the first time was a different kind of test. 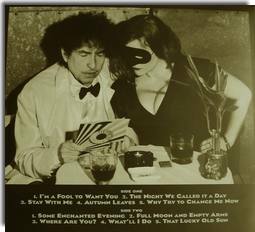 And as I listened to Bob not quite making a note here and there on this first track of Shadows In The Night, the thought that came to my head was the following: “Maybe this just isn’t going to work.” There was, in the end, no reason it was guaranteed to work. There is nothing automatic about good music: even less so about great music. By the time the final track—“That Lucky Old Sun”—played, it had become completely clear whether the album had worked or had not. Although it’s not my style to do plodding track by track album reviews, I can figure out no more fitting way but than to write about this record song by song, from the first track to the tenth. The opener, “I’m A Fool To Want You,” which jarred me on first hearing, would still stand today as my least favorite track, but on it Bob gives every iota of himself, as he does on all ten tunes. I’ve always heard this song as one coming from someone who is broken, who has crossed a crucial line beyond autonomy, beyond hope for picking himself up and walking away from this attachment that is nonetheless taking him to a very dark place. There is at least no question but that Dylan’s version gets at that sense of brokenness, and it does so in a way that is all his own. Dylan on the other hand knows religious songs, and he clearly knew much better than this average Sinatraphile just how good a religious song “Stay With Me” truly was. I don’t know where the lyricist Carolyn Leigh (who wrote “Witchcraft” and “The Best Is Yet To Come”) got this from—but then if there’s anything to this “God” stuff, I guess one must concede that it is universal, and a lyricist skilled at probing the heart will be able to summon it up, after all. Leigh most certainly did that, and Dylan understands how penetrating and true an expression of the constantly faltering relationship with the Creator the song is, and he sings the lines with an honesty and vulnerability that is both bracing and moving. Picking up on this song at all was an act of great insight on Bob’s part. And his performance of it on this record does it true justice, and is nothing less than a gift—especially for those who’ve sympathetically followed the thread of his spiritual journey throughout his work and drawn sustenance from it themselves. “Autumn Leaves” is the fourth track and was the first to utterly nail me on my initial listen to the album, and it remains impossible for me to hear it without being frozen to the spot. The guitar introduction evokes a weird and melancholy wind in the trees, and Dylan sings this song from a place that knows only too well the loss at the center of the words. It’s so easy for a performance of a song like this one to be a mere cliché; instead, Dylan meets the challenge of taking it to possibly an even more profound level than one has heard before. His singing conjures the desolation of someone who is not just experiencing another lonely autumn, but has no expectation of living for another spring. For all that (which some would would call “depressing”) it is utterly beautiful. 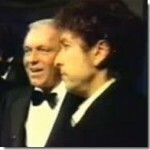 Bob handles “Why Try to Change Me Now” with a light touch. It is, I think, the most graceful song of a misfit that one could find, and (while we are all misfits in our way) it is perfect in that sense for Dylan, who has always been badly misfitted into any role in which people have tried to place him, and who has never hesitated to let that be known, via very sharp elbows at times. There’s no sharpness here, however, and the vocal is gentleness incarnate. He doesn’t reach for and achieve the kind of darkness in the conclusion that Sinatra did in his 1959 version, but the closing line Bob delivers certainly possesses an exquisite note of sadness and resignation. “Some Enchanted Evening” (which kicks off side two on a springier kind of note) is one of the great revelations of this album. Hearing this Rodgers and Hammerstein song in Dylan’s voice—in his voice now—and sung with such warmth, sensitivity and love, elevates it to a level that this listener at least could not have imagined it occupying before. Sung like this, it is a loving song about romantic love coming from someone who sounds like he has loved and lost—lost terribly—and likely has gone through that cycle over and over again, and now is at the point where that whole game is truly over: that kind of love is long gone and is not going to come round again, and he knows it very well. Yet, although it slipped tragically from his hands, and more than once, he still believes in it completely and sincerely, and is softly urging someone very much younger to put his faith there and to keep that faith: “Once you have found her, never let her go.” Coming from this place, it is devastating. And Dylan’s singing on this song is nothing less than sublime, wrenching every nuance from words that had seemed so straightforward. 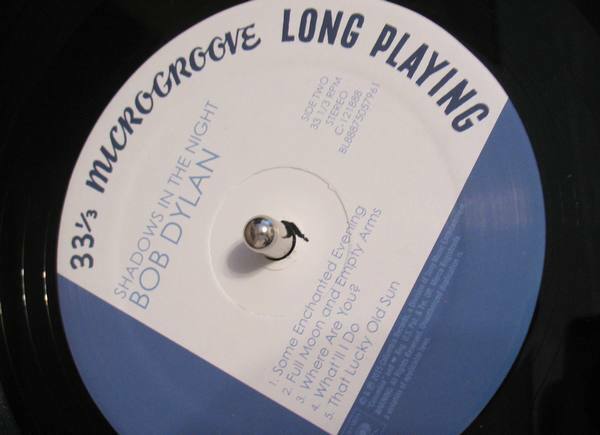 Dylan takes a song of general positivity and good cheer and makes it fit on an album rightly titled Shadows in the Night. I would suggest that Bob Dylan’s “Some Enchanted Evening” is a masterpiece. I wrote on Dylan’s “Full Moon and Empty Arms” when it was first released online almost a year ago, and don’t now have much cause to revise my opinion of it. It is a case very similar to “Stay With Me,” where Dylan has taken a song that was not well known at all—that Sinatra did not himself make a spectacular record out of— and found and expressed great depths within it. Tangentially, I should mention here that it’s been suggested that Dylan’s take on all of the songs on this album is religious in nature; i.e. that he is all the time singing to God rather in the context of human and romantic love. While the sentiments in all of these songs are certainly profound and durable on multiple levels, I’m not inclined to embrace that view; I think that Dylan is singing the songs with the sense they’ve always plainly presented, albeit that he cannot help but supply his own resonances. (And we as listeners supply our own.) “Full Moon and Empty Arms,” however, is a lyric with cosmic overtones that cannot but help make one think of some poor pilgrim, such as any one of us, standing humbly between the night, the moon and the Creator. And Dylan’s deep and emotive rendition undoubtedly helps brings such a sense of it to the surface. 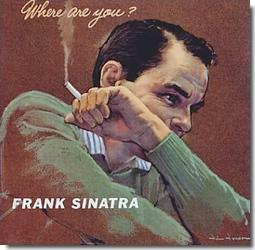 “Where Are You?” arrives with a swirling and gently entreating pedal steel intro. The notable thing about this lyric is its bluntness (as previously reflected upon with regard to Sinatra’s version), and Dylan does nothing to sidestep that, but dives right in. The “dog with his leg caught in barbed wire” is here a completely unselfconscious abandoned hound, virtually howling that blunt title and refrain. WHERE ARE YOU? He brings it down enough at certain stages to let you know that he doesn’t have to howl it, that he can coax some nuances out of the song as well, but on a certain level “Where Are You?” is just that honest expression of a lonely animal—albeit dignified by its very stately melody—and Bob gets that, and you as the listener are going to get it too. So the album has been really quite good up to this point, overall, but now we have reached the fourth track of side two. And it is this song, “What’ll I Do,” the Irving Berlin classic, that just tears it for me. It did so on my first time listening to the album, and it does so only more so every time I listen. Why do these simple lines, as sung by Bob Dylan here in 2015, make me weep and melt into a helpless mass of flesh and bone? There is no ultimate answer, nor should there be (just as there is no answer needed to the question this song asks) but one knows that it must have something to do with (again) resonance. Generating resonance is a special gift of Bob’s. It is his ability to find the link between things apparently disparate and amplify the sum of all those parts. He does it in his lyrics all the time. All I know here is that this song brings to my mind Bing Crosby, in his early years, as much as it does Sinatra’s transcendently beautiful recording on Columbia, and then later Frank’s older and more reflective rendition with Gordon Jenkins on the album All Alone. So there’s a lot right there, not even to mention how many other greats have sung it so well. But then also present is the composer, Irving Berlin, the Russian Jew and New Yorker who also wrote “God Bless America” and “White Christmas” and alone could be said to embody the power and genius of the greatest popular songcraft. Put all of these resonances together and then add Bob Dylan and now you’ve got quite a huge thing going on, a thread that is truly beyond expression. But then—and maybe this is what tears it—put all of those resonances together with as beautiful and honest and heartbreaking and pure a song as “What’ll I Do” is and there’s simply no defense. 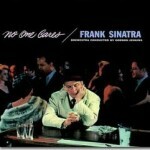 There’s a story of Sinatra that I’ve encountered more than once, and maybe you have too. The details and sourcing don’t even matter anymore; if it is only apocryphal than so be it. It’s a story of him going through a period of anguish in his relationship with Ava Gardner (as if there were other kinds of periods), and staying over with some friend, probably a songwriter or musician chum. Frank is mad at Ava, no holds barred, and takes out a photograph of her and then rips it up, tossing the pieces away. He’s done with that broad. The friend leaves for a while, and then, when he returns, he finds Frank crawling on the floor, picking up the pieces of that photograph, crying, trying to tape it back together again. Irving Berlin’s sublime popular song of 1923, “What’ll I Do,” somehow comprehends all of these tragedies of love and so many more (even I dare to think the loss that is death itself), and Bob Dylan’s rendition of 2015 nails every resonance that was already there and contributes his own. This perfect performance by Bob and his band fairly floats on a musical cloud somewhere between pure beauty and utterly unbearable loss. It is breathtaking. It’s a song that seems to come from very much the same place as “Ol’ Man River,” but, unlike that song—which is part of Jerome Kern’s and Oscar Hammerstein II’s musical Showboat—”That Lucky Old Sun” comes seemingly out of nowhere. It was composed in 1949, music by Beasley Smith and lyrics by Haven Gillespie. Gillespie’s life story reads itself like a poem of American life, even the Wikipedia version. There’s no explaining where the song came from, and that in itself puts Bob Dylan on extremely familiar ground. Although Sinatra recorded it right then in 1949, the biggest hit that year was by Frankie Laine, and in my internal jukebox I personally hear it sung by Ray Charles and most especially by Louis Armstrong. They both wear it very well, because like “Ol’ Man River” the song implicitly evokes the experience of black Americans, and of slavery, and the toiling and the crying and the yearning for something better on high, and notions we associate with black spirituality in the Deep South. When sung by a white singer, like Sinatra, there is at least a degree of affectation that seems inescapable, even though the song was written by white men. And yet in Dylan’s version, because of who and what he is, that burden of affectation is dissolved. That whole angle on the song just disappears, because he’s just bigger than all of that stuff. White Jew he may be, but he’s earned his credibility here if anyone has; he’s transcended all the labels. He’s done the blues, he’s done gospel, he’s been doing it for over fifty years, he’s lived in that music and for that music, paid a price for it at times, and there’s no affectation required. Race is not an issue. Skin is not an issue. The song itself is the only issue here, and it turns out to be a song that Bob Dylan of all people can sing for what it is, and he stands at the microphone here and sings it nakedly. And, of-course, it is nothing but a prayer. It’s a universally applicable prayer, from any poor bag of bones as each one of of us surely is, yet it’s also a particularly American prayer. And on the wonderful intro to this track, the gentle horn section plays a line that seems to evoke America as in the big sky, the plains, John Ford, the desert, and the whole sweeping shebang. It wows me and puts me back on my heels every single time I hear it. But after hearing it the first couple of times I went back (as I’ve been wont to do) to listen to Sinatra’s version of this song, and—lo and behold— there’s essentially the very same intro. But it just doesn’t strike you quite the same on Sinatra’s recording because that wasn’t Sinatra’s territory in the way that it is Dylan’s. And none of these tracks will strike you the same as Sinatra’s or anyone else’s. Time will have something to tell about where they “rank” relative to other versions: it’s silly to talk about that now. It suffices to say—and it is a quite a lot to say—that Dylan on each and every song here has done something that stands up, that deserves to be reckoned with. There’s no novelty and no irony here. He has done justice to these songs, and this album will not be forgotten. By ending with “That Lucky Old Sun,” it seems to this listener at least that Dylan takes all of the heartbreak contained in the previous nine tracks of love, loss, and loneliness, and makes it a part of his appeal to that Lord above. And in his selection of these songs, no less than in his performance of them, Bob Dylan—a great American poet who, thank God, just refuses to go away—has written yet another great poem, one that most certainly pays tribute to the memory of Frank Sinatra, and one that also highlights in a unique manner the profound truth and beauty that underlie even what appear to be these passing whimsies of American popular song. What’s left to say? Nice job, Bob.